IF YOU DEVELOP THE SKILL OF REMAINING CALM DURING STRESSFUL SITUATIONS, YOU WILL FEEL BETTER ABOUT YOURSELF. YOU WILL SUCCUMB TO NEGATIVE EMOTIONS SOMETIMES. IT’S PART OF THE PROCESS OF LEARNING TO BE A HAPPY MUSLIM. BE PATIENT WITH YOURSELF. SOMETIMES JUST SAYING “I AM FEELING REALLY HURT” (OR ANY OTHER NEGATIVE FEELING) CAN REDUCE THE POWER OF YOUR NEGATIVE FEELING. YOU WILL ACCELERATE YOUR JOURNEY TO BEING A HAPPY MUSLIM BY FOCUSING ON YOUR PERSONAL STRENGTHS MORE THAN YOUR WEAKNESSES. 1. REMAINING CALM IN EVERY SITUATION. 2. LETTING GO OF THOUGHTS THAT ARE NOT HELPFUL TO YOU. 3. FOCUSING ON WHAT YOU ARE THANKFUL FOR. ASK ALLAH (SWT) TO MAKE YOU A HAPPY MUSLIM. 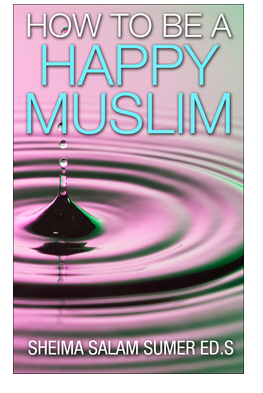 THIS BOOK IS MEANT TO INCREASE YOUR SELF CONFIDENCE IN YOUR OWN ABILITY TO FIND YOUR OWN PERSONAL WAY OF BECOMING A HAPPY MUSLIM. DUAA IS THE WEAPON OF THE BELIEVER. UNDERSTAND THAT WHEN YOU BRING YOURSELF TO A STATE OF INNER PEACE AND HAPPINESS, IT WILL BE EASIER TO SOLVE ANY PROBLEMS YOU ARE FACING. Every night, think of at least 3 things that you are feeling grateful to Allah for. It could be things specific to that day or general things, but it should be GENUINE. One thing that I am always grateful for is the health of my children. It could be anything that YOU really FEEL. (I originally read this simple activity in the book “Happy for No Reason” by Marcy Shimoff). Gratitude is an incredible way to feel connected with Allah because you KNOW that He gave you those things. Remember, all help is from Allah. Every good thing you have is from Allah. BELIEVE IN THE HADITH THAT SAYS, “IT IS ALL GOOD FOR THE BELIEVER.” EVERYTHING THAT HAPPENS TO A BELIEVER IS GOOD IN SOME WAY. TAKE A FEW MINUTES EACH DAY TO FORGET ALL YOUR WORRIES AND SEND PEACE AND BLESSINGS ON OUR PROPHET (PBUH). THE BLESSINGS OF ALLAH ARE ALWAYS GREATER THAN OUR PROBLEMS! What are you GENUINELY grateful to Allah for? 1) Gratitude and Patience are the two states of the believer. VIEW LIFE’S DIFFICULTIES AS OPPORTUNITIES TO LEARN AND GROW. YOU WILL FEEL MORE EMPOWERED. USE YOUR SPEECH FOR ONLY GOOD TOPICS. 1. LOVE YOUR POSITIVE QUALITIES. CHOOSE YOUR IDEAL WEIGHT AND THEN WORK TOWARDS ACHIEVING IT WHILE AT THE SAME PRAYING TO ALLAH ABOUT IT. KEEP TRYING TO FIND A THOUGHT THAT MAKES YOU FEEL BETTER. FULLY EXPOSE YOUR NEGATIVE THOUGHTS! TRAIN YOURSELF TO RECOGNIZE YOUR THOUGHTS, TO BETTER UNDERSTAND YOUR FEELINGS. AND REMEMBER: YOU ARE NOT YOUR THOUGHTS. IF IT BRINGS YOU JOY, AND IT DOESN’T GO AGAINST THE TEACHINGS OF ISLAM…THEN DO IT! Always look for the positives and then use the positives to improve the overall situation. Example: You are a teacher working with a difficult student. Look for positive aspects/resources. Perhaps the student’s parents are willing to do whatever they can to help. Perhaps the student likes certain subjects and behaves better when learning those subjects. Perhaps the student has a classmate who works well with the student. Use these resources! When life gives you lemons, make lemonade. MashaAllah, jazzakallah, May Allah s.w give u reward u in akhirah. this is beautiful, someone had finally posted something useful , i wish you can post more topics for womens. this really helps in all situations.